As promised, here are some more photos from Kenya, sorry it took so long, but as always, slow Internet. 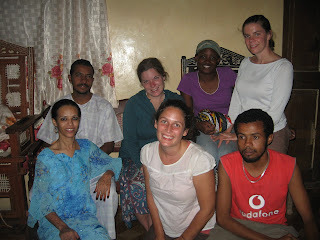 Our trip started out with a very long overnight bus ride to Nairobi where we got to stay with one of Hannah's friends. We stayed there for two days, and we were constantly surprised by the amount of development in the city. They had street lights everywhere and actual malls with stores resembling Barns and Nobel and even Starbucks! 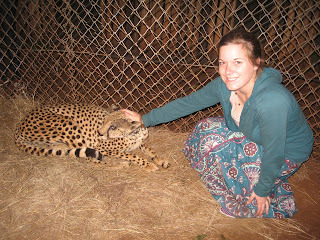 My favorite part was when we got to go to the zoo and pet a cheetah! I was only slightly terrified that he would want to eat my hand for lunch. 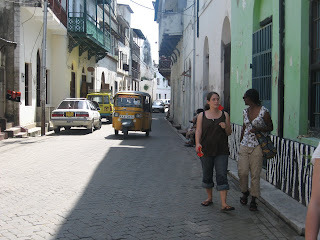 After Nairobi our group headed to Mombasa for one day where we toured Fort Jesus located on the coast. In stead of using motorcycles the main mode of transport here was the tuk-tuk, so much fun! 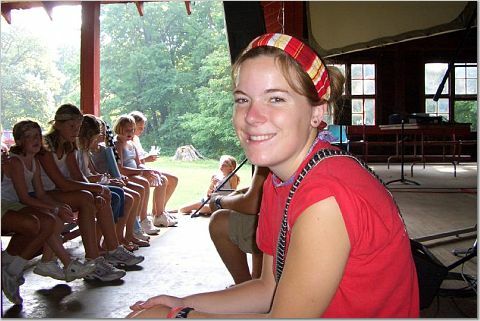 See small yellow vehicle in picture below beside Hannah and Courtney. 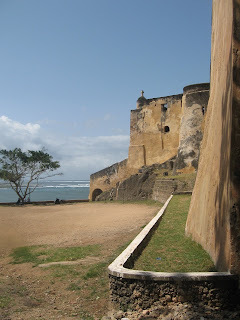 Fort Jesus is a Portuguese fort built in 1590 by order of King Philip II of Spain (King Philip I of Portugal), then ruler of the joint Portuguese and Spanish Kingdoms, located on Mombasa Island to guard the Old Port of Mombasa, Kenya. The fort was built in the shape of a man, most likely Jesus, hence the name. The people building thought the shape out help them to protect themselves more. Outside of the fort.... and Courtney and I inside the fort pretending to be guards, you know you would be scared of us! 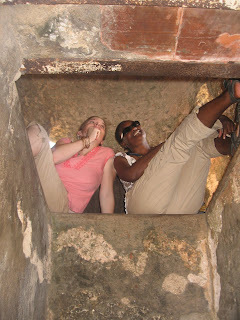 We then headed up the cost to the Gede ruins just north of Mombasa. Gede is an ancient, mysterious place which has no record of existing in history except for the ruins of the old castles. It was suspected that it was a place which the elite of Kenya went to hide away, mafia perhaps? Estimated to be built in the 13th century, their palace was complete with running water. Something my village in Uganda doesn't even have today. 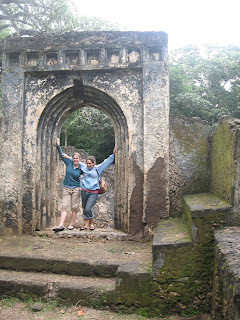 Below is Hannah and I at the old entrance to Gede. 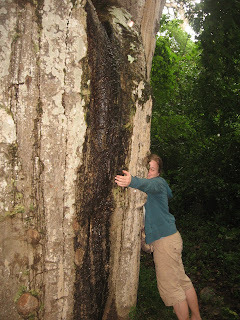 One of my favorite parts of Kenya were the boboa trees which were giant and everywhere. 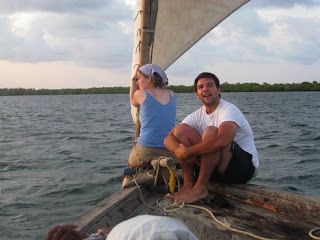 After Gede we went further north to the cost where we were met by our lovely friend, Abdala who brought his boat to drive us to the island of Lamu. Abdala is the cousin of the brother-in-law to professor Gearhart, a professor I had at IWU. He showed us around the beautiful island and introduced us to his friends. 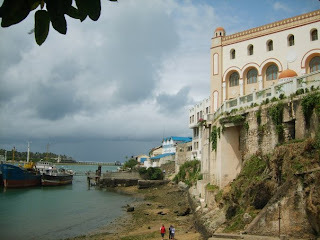 Because it has been used as a trading island, it has become a wonderful mix of Portuguese, Chinese, Arabic and Swahili cultures all together in a beautiful mixture. The island is rich in stunning art work with exquisit detail like the door in the picture below. 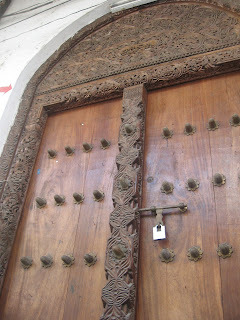 Traditionally, the Swahili culture takes pride in their entryways to their homes and most people make intricate carvings for all of their doors. Besides the wonderful people and places, the food was also increadable, I had forgotten how much I love seafood. 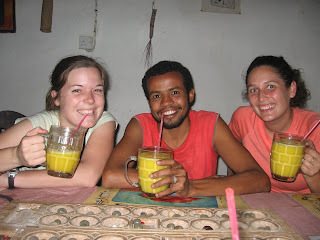 Also, at almost every meal we enjoyed delicious juices (mango, papaya, coconut, pineapple, avocado ect.) 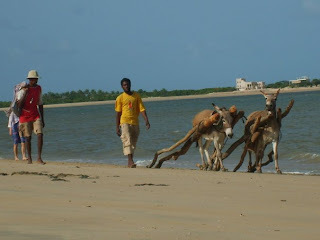 We thought that transport could not be any better than the tuk-tuks in Mombasa, but we were wrong as the main mode of transport on Lamu was......donkeys! They only have 3 vehicles on the whole island and everyone else gets around on donkeys. We spent a week on this amazing island enjoying the ocean, food and friendly locals. Abdala had us over to his house one night for a crab feast where we got to meet Dr. Gearhart's lovely family. We spent one whole day in the best way possible, on a sail boat. They have dows you can rent for the day complete with an amazing crew and we even got to go fishing! Don't be to jealous Dad, we didn't catch anything. 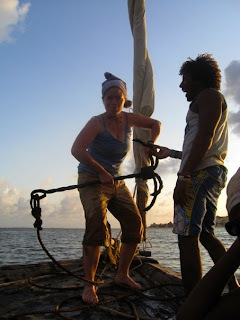 Pinto our captain let me help pull in the anchor! Lisandro and I on the boat enjoying the water. 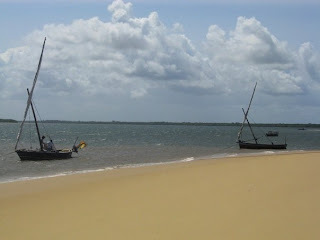 We sadly had to leave, but I know one day I will go back to Lamu. If anyone wants to go, just let me know and I will tag along.